Are you eagerly anticipating traditional holiday foods? Or, perhaps you are interested in baking some cakes and cookies? Celebrate the spirit of the season with some cool recipes from our library and other collections that are available online for free. 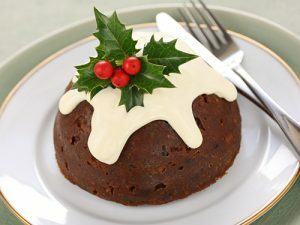 If you are in the mood to try out pudding, check out Plum Pudding: of Divers Ingredients, Discreetly Blended & Seasoned. Apart from our library holdings, there are good online recipe collections. The University of Nevada, Las Vegas has great historical menus in their digital collections. There are also some delicious recipes from the Feeding America Cookbook Project which includes Christmas Cookies, New Year’s Cake, Ginger Cake, Plum Pudding, Egg Nog, and many more! As you are working on preparing the feast, enjoy watching the strange traditions clip from the History Channel. By the way, if you’re in Baltimore and coming to the library, be sure to check the hours we’re open. Thanks for sharing. I am going to get that one to read. I read a good novel earlier this year that included collectible cookbooks, “The Cookbook Collector” by Allegra Goodman. Sweet book about two sisters, their love lives, ancient cookbooks and technology set in the late 1990’s, early 2000’s.